Posted on March 30, 2008 by Ching under Flickr, Life, School. 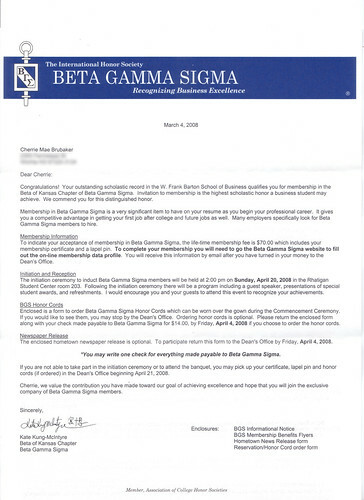 I know mom says I don’t really need someone to give me a pat on the back for doing well academically, but I took Beta Gamma Sigma (BGS) up on their invite. I’m being inducted into the organization on April 20th. I received a bunch of informational stuff about BGS as an undergrad. They kept sending letters saying you’re doing great, keep it up, and maybe we’ll invite you. As you know, you have to be in the top 10% of your graduating class (as an undergrad) to be eligible and my GPA was not good enough (due in part to my bulakbol days as a Comp Sci and Engineering major). Since they look at your cumulative GPA, I just couldn’t overcome all those bad grades the first time that I went to college. I think my business GPA was a 3.8, but I ended up with a 3.2 cumulative GPA after you consider my 170-plus credit hours. Needless to say, a 3.2 is not good enough. Anyway, the nice thing is I get to start over in grad school. So I have a clean slate. I don’t have to worry about those miserably unsuccessful Engineering and Programming classes. So far in grad school I’ve only received one B — but that’s okay, because it’s in Operations Management, and everyone knows that class is horrid. Hopefully, I will get an A in my last class and I’ll keep my 3.9. Either way, I’m being inducted into BGS so I’ll be okay if I get a B. I’ll be disappointed, but it won’t be the end of the world. I got invited to Golden Key last year, but I had reservations when I read about some of the corruption that has tarnished the organization. I found out today that my invitation is still open so I went ahead and joined. What the heck. Why not? So now I’m a member of both BGS and Golden Key. I’m $200 poorer for the membership fees and such, but I feel ten times special. Let’s hope the $200 will prove to be a good investment. Only time will tell. Posted on March 30, 2008 by Ching under Movies. When we watched Jumper last month, the server ended up spilling soda all over the place so we all got free movie passes. Brian’s parents, who went with us, redeemed their free passes last week for Horton Hears a Who. We redeemed ours today for 21. I must say that it is the best free movie we have ever seen. Jim Sturgess, who I haven’t really seen before (at least not that I can recall), did a fantastic job of playing the lead role; Kate Bosworth is always cute; and Kevin Spacey is always fantastic. He is good in all the movies I’ve seen him in. Posted on March 30, 2008 by Ching under Sponsored Post. When Kansans think of KU, we think of University of Kansas. We think of the Jayhawks. In Michigan, KU means Kettering University, the #1 university for industrial and manufacturing engineering according to US News Best Colleges. If you’re a soon-to-be high school grad and are thinking of going into the industrial, manufacturing, and mechanical engineering fields, Kettering University is the college that you should consider. Kettering University, located in Flint, Michigan, was originally founded as The School of Automotive Trades. Then Kettering became known as the Flint Institute of Technology before being acquired by General Motors in 1926 and renamed General Motors Institute of Technology. In 1932 the school’s name was shortened to General Motors Institute. In 1982, GM divested ownership and the school became GMI Engineering and Management Institute. In 1998 the school changed its name to the current name, Kettering University, in honor of Charles F. Kettering, an early 20th century inventor, proponent of cooperative education, and early benefactor of the school. Today the coop program is still the key to the success of Kettering students and alums. It is what makes the university special. Anyway, check out my favorite Kettering recruiting video below. Posted on March 23, 2008 by Ching under Family, Life. 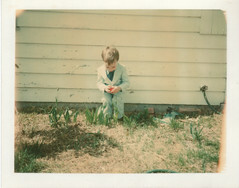 This has got to be my favorite Easter photo. Brian looked so cute in his pastel green suit. Simply adorable! Anyway, today will be spent at the Brubakers. Grandma and Grandpa went to church with Dave and Donna this morning and then we are meeting up at Dave and Donna’s for a late Easter lunch. I would have gone to church, too. Brian didn’t want to, though. In hindsight, I’m glad we didn’t commit to going because I’m achey all over. Brian and I decided to renew our gym membership last week. My first workout back was Pam’s step class on Wednesday. Rightfully so, because she is my favorite instructor. Several years ago, when I got addicted to working out, I went to her fitness classes religiously. Religious is appropriate here because she had a step class on Sundays that I attended every week, rain or shine whether or not I was feeling well. I decided since I am completely out of shape, I better take it easy. I did a step with no risers. So I was pretty much just doing floor exercise because a step with no risers is not that much higher off the floor. Step was pretty energizing. It was great. Posted on March 22, 2008 by Ching under Life. Last night on the drive home from Carrabba’s, we played a game. It’s like the movie game (game where you say a movie title and the other person has to say another movie title that begins with the last letter of the movie title the previous player named) except we modified it just for words period. You have to say the word and say what it means. So it’s like a vocabulary game to help Brian build his vocab. Although, it’s not his vocab we really need to work on but his spelling skills. That’s a whole other topic, though. Anyway, I started with “pedestrian” because I was thinking the conversation at that point had been so, until I cleverly devised our game. Brian patiently played along. Usually, I can never get him to go along with my games and other antics. Surprisingly, he did. He seemed to be enjoying the game, too. That’s the impression I got anyway, since I didn’t have to force him to play. There’s a lot to be said about an honest man.